Traveling to Egypt but not up for an alternative destination other than Cairo or Luxor? Alexandria is more laid back – take a look at what this city has to offer travelers. 1. The Alexandria Amphitheater: The amphitheater in Alexandria is a favorite among tourists who love to take a walk through these magnificent ancient ruins which were once the site of numerous musical and poetic performances. 2. Fabulous cuisine: Alexandria is certainly not short of delicious food, with many restaurants across the city offering a variety of amazing Egyptian cuisine. If you are into seafood, Balbaa Village is the place to go. Their seafood is always fresh and top quality; that’s what has made it a favorite among tourists and newcomers to the city. 3. 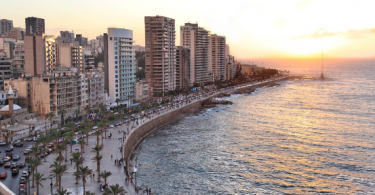 Beaches: Planning a trip to one of Alexandria’s lovely beaches is a must while you are on a visit. Maamoura Beach is a good choice. The warm sea breezes make for a pleasant walk along the sand, and the calming scenery keeps visitors coming back year in and year out. 4. Snorkeling: Snorkeling along Egypt’s coastline has always been a major drawing card for tourists to the region. Alexandria has a beautiful array of marine life in the Red Sea which includes the coral reef with its crystal clear blue waters making it a great spot for swimming and snorkeling, and diving for the more adventurous. 5. The Royal Jewelry Museum: The museum has exclusive displays of jewelry collections which belonged to the Egyptian royal family. Artworks from the royal family’s home, as well as many of their other personal effects, are on public display. A visit to the Royal Jewelry Museum will leave you enthralled, and it’s an interesting addition to your trip. 6. Visit the Catacombs: Intellectuals interested in archaeology and history, take a trip to the catacombs of Kom el Shoqafa where you can spend hours exploring these ancient sites with plenty of stories to take home. 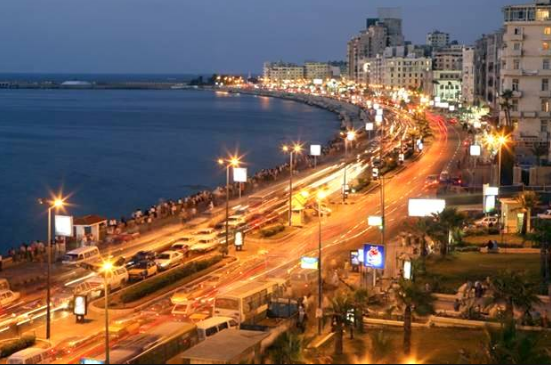 It is one of Alexandria’s most notable attractions, so be sure to make a stop there. 7. Mustafa Kamel Necropolis: A hidden gem in Alexandria, this is an intriguing tomb site which is often overlooked. Those who do get a chance to visit are surprised by the tombs’ complexities and find them utterly amazing. 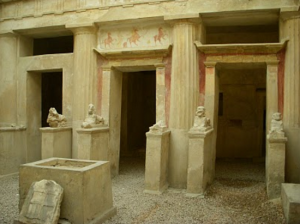 Inside the tombs, one will find small temples, offering tables and other items. 8. Mouthwatering Desserts: Egyptian desserts, in general, are a real treat and if you are in Alexandria, pay a visit to the Brew & Chew Restaurant. They have scrumptious molten cakes and chocolate pizza for anyone with a sweet tooth. 9. Alexandria Opera House: The Alexandria Opera House has received rave reviews for their musical performances and will give you a look at a more metropolitan side of the city. 10. Alexandria’s Main Souq: The main souq in the city is an experience not to be missed. The market stretches all the way from Midan Tahrir to the center of the city. 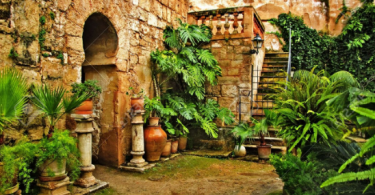 Here you will have “an authentic Alexandrian experience” and haggle with the locals trying to get the best price you possibly can on their beautiful items on sale. 11. The famous Mosque: The most famous mosque in Alexandria is the Abu Abbas al-Mursi Mosque. It is a landmark in the city with many tourists coming through each day to view the Islamic calligraphy designs throughout the walls of the mosque. 12. Camel Tours: The camel tours in Alexandria are popular and offer interesting packages to tourists, and not to mention some great photo ops. 13. 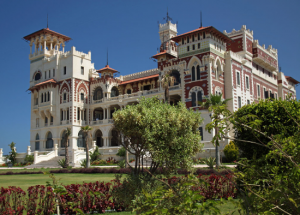 King Farouk Palace: Visiting the King Farouk Palace you will see the most spectacular scenery. The palace is beautiful and intriguing, and you’ll take home some memories to share as you walk within the walls of this splendid home. 14.The Alexandria Film Festival: The festival has put the city on the map as a hotspot for cultural festivals. It is also well-organized, and both local and international celebrities come to experience it each year. 15. The Lighthouse: The fascinating Lighthouse of Alexandria is known as one of the seven wonders of the world, with a vast history and beauty, constantly drawing visitors to come and see this popular landmark for themselves.